Christophe Grenier is a 5th year student at the ESIEA, where he also works as a sysadmin. He has a passion for computer security. Frederic Raynal has been using Linux for several years because it doesn't pollute, use hormones, MSG or animal bone-meal... only sweat and cunning. In our previous article we wrote a small program of about 50 bytes and we were able to start a shell or exit in case of failure. Now we must insert this code into the application we want to attack. This is done by overwriting the return address of a function and replace it with our shellcode address. You do this by forcing the overflow of an automatic variable allocated in the process stack. For example, in the following program, we copy the string given as first argument in the command line to a 500 byte buffer. This copy is done without checking if it's larger than the buffer size. As we'll see later on, using the strncpy() function allows us to avoid this problem. buffer is an automatic variable, the space used by the 500 bytes is reserved in the stack as soon as we enter the main() function. When running the vulnerable program with an argument longer than 500 characters, the data overflows the buffer and "invades" the process stack. As we've seen before, the stack holds the address of the next instruction to be executed (aka return address). To exploit this security hole, it is enough to replace the return address of the function with the shellcode address we want to execute. This shellcode is inserted into the body buffer, followed by its address in memory. Diag. 1 : buffer especially filled up for the exploit. Diagram 2 describes the state of the stack before and after the overflow. It causes all the saved information (saved %ebp, saved %eip, arguments,...) to be replaced with the new expected return address: the start address of the part of the buffer where we put the shellcode. However, there is another problem related to variable alignment within the stack. An address is longer than 1 byte and is therefore stored in several bytes and this may cause the alignment within the stack to not always fit exactly right. Trial and error finds the right alignment. Since our CPU uses 4 bytes words, the alignment is 0, 1, 2 or 3 bytes (check Part 2 = article 183 about stack organization). 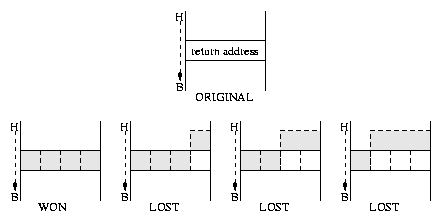 In diagram 3, the grayed parts correspond to the written 4 bytes. The first case where the return address is overwritten completely with the right alignment is the only one that will work. The others lead to segmentation violation or illegal instruction errors. This empirical way to search works fine since todays computer power allows us to do this kind of testing. We are going to write a small program to launch a vulnerable application by writing data which will overflow the stack. This program has various options to position the shellcode position in memory and so choose which program to run. This version, inspired by Aleph One article from phrack magazine issue 49, is available from Christophe Grenier's website. How do we send our prepared buffer to the target application ? Usually, you can use a command line parameter like the one in vulnerable.c or an environment variable. The overflow can also be caused by typing in the data or just reading it from a file. The generic_exploit.c program starts allocating the right buffer size , next it copies the shellcode there and fills it up with the addresses and the NOP codes as explained above. It then prepares an argument array and runs the target application using the execve() instruction, this last replacing the current process with the invoked one. The generic_exploit program needs to know the buffer size to exploit (a bit bigger than its size to be able to overwrite the return addresss), the memory offset and the alignment. We indicate if the buffer is passed either as an environment variable (var) or from the command line (novar). The force/noforce argument determines if the call runs the setuid()/setgid() function from the shellcode. To benefit from vulnerable.c, we must have a buffer bigger than the one expected by the application. For instance, we select 600 bytes instead of the 500 expected. We find the offset related to the top of the stack by successive tests. The address built with the addr = get_sp() + offset; instruction is used to overwrite the return address, you get it ... with a bit of luck ! The operation relies on the heurism that the %esp register won't move too much during the current process and the one called at the end of the program. Practically, nothing is certain : various events might modify the stack state from the time of the computation to the time the program to exploit is called. Here, we succeeded in activating an exploitable overflow with a -1900 bytes offset. Of course, to complete the experience, the vulnerable target must be Set-UID root. In the first case (noforce), our uid doesn't change. Nevertheless we have a new euid providing us with all the rights. Thus, even if vi says while editing /etc/passwd that it is read only we can still write the file and all the changes will work : you just have to force the writing with w! :) The force parameter allows uid=euid=0 from start. In our exploit we didn't take into account the potential alignment problems. Then, it's possible that this example doesn't work for you with the same values, or doesn't work at all because of the alignment. (For those wanting to test anyway, the alignment parameter has to be changed to 1, 2 or 3 (here, 0). Some systems don't accept writing in memory areas not being a whole word, but this is not true for Linux. Since our exploit is only able to do one task at a time, we are going to transfer the rights gained from the run_shell program with the help of the set_run_shell program. We'll then get the desired shell. The -i option corresponds to interactive. Why not giving the rights directly to a shell ? Just because the s bit is not available for every shell. The recent versions check that uid is equal to euid, same for gid and egid. Thus bash2 and tcsh incorporate this defense line, but neither bash, nor ash have it. This method must be refined when the partition on which run_shell is located (here, /tmp) is mounted nosuid or noexec. Since we have a Set-UID program with a buffer overflow bug and its source code, we are able to prepare an attack allowing execution of arbitrary code under the ID of the file owner. However, our goal is to avoid security holes. Now we are going to examine a few rules to prevent buffer overflows. probably holds an error because of the <= sign instead of < since an access is done beyond the end of the array. If it's easy to see in that loop, it's more difficult with a loop using decreasing indexes since you must ensure that you are not going below zero. Apart from the for(i=0; i<n ; i++) trivial case, you must check the algorithm several times (or even ask someone else to check for you), especially when the index is modified inside the loop. The same type of problem is found with strings : you must always remember to add one more byte for the final null character. One of the newbie's most frequent mistakes lies in forgetting the string terminator. Worse, it's hard to diagnose since unpredictable variable alignments (e.g. compiling with debug information) can hide the problem. Don't underestimate array indexes as a threat to application security. We have seen (check Phrack issue 55) that only a one byte overflow is enough to create a security hole, inserting the shellcode into an environment variable, for instance. Functions that limit the copy length avoid this problem These functions have an `n' in the middle of their name, for instance strncpy(3) as a replacement for strcpy(3), strncat(3) for strcat(3) or even strnlen(3) for strlen(3). Of course, the same principles apply to routines manipulating wide characters (more than 8 bit), for instance wcsncpy(3) should be prefered to wcscpy(3) or wcsncat(3) to wcscat(3). Sure, the program gets bigger but the security improves, too. Like strcpy(), strcat(3) doesn't check buffer size. The strncat(3) function adds a character at the end of the string if it finds the room to do it. Replacing strcat(buffer1, buffer2); with strncat(buffer1, buffer2, sizeof(buffer1)-1); eliminates the risk. In some circumstances it's impossible to truncate that way (path, hostname, URL...) and things have to be done earlier in the program as soon as data is typed. A program running with privileges other than those of its user implies that you protect all data and that you consider all incoming data suspicious. This formatting limits the number of characters copied into buffer to 255. On the other hand, scanf() puts the characters it doesn't like back into the incoming stream so the risks of programming errors generating locks are rather high. As you can see, it does no tests ! We are in a situation similar to gets(char *array) while using C : a door is wide open. The ios::width() member function allows to fix the maximum number of characters to read. The reading of data requires two steps. A first phase consists of getting the string with fgets(char *array, int size, FILE stream), it limits the size of the used memory area. Next, the read data is formatted, through sscanf() for example. The first phase can do more, such as inserting fgets(char *array, int size, FILE stream) into a loop automatically allocating the required memory, without arbitrary limits. 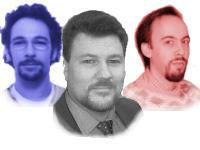 The Gnu extension getline() can do that for you. It's also possible to include typed characters validation using isalnum(), isprint(), etc. The strspn() function allows effective filtering. The program becomes a bit slower, but the code sensitive parts are protected from illegal data with a bulletproof jacket. Direct data typing is not the only attackable entry point. The software's data files are vulnerable, but the code written to read them is usually stronger than the one for console input since programmers intuitively don't trust file content provided by the user. The buffer overflow attacks often lean on something else : environment strings. We must not forget a programmer can fully configure a process environment before launching it. The convention saying an environment string must be of the "NAME=VALUE" type can be exploited by an ill-intentioned user. Using the getenv() routine requires some caution, especially when it's about return string length (arbitrarily long) and its content (where you can find any character, `=' included). The string returned by getenv() will be treated like the one provided by fgets(char *array, int size, FILE stream), taking care of its length and validating it one character after the other. The strspn() function makes it easy : it looks for the first character not part of the good character set. It returns the string length (starting from 0) only holding valid characters. You must never reverse the logic. Don't validate against characters that you don't want. Always check against the "good" characters. These lines bloat the code and risks memory leaks, but we must take advantage of these changes to modify the approach and avoid imposing arbitrary length limits. Let's add you can't expect the same result using the alloca(). The code looks similar but alloca allocates the data in the process stack and that leads to the same problem as automatic variables. Initializing memory to zero using memset() avoids a few problems with uninitialized variables. Again, this doesn't correct the problem, the exploit just becomes less trivial. Those wanting to carry on with the subject can read the article about Heap overflows from w00w00. Last, let's say it's possible under some circumstances to quickly get rid of security holes by adding the static keyword before the buffer declaration. The compiler allocates this variable in the data segment far from the process stack. It becomes impossible to get a shell, but doesn't solve the problem of a DoS (Denial of Service) attack. Of course, this doesn't work if the routine is called recursively. This "medicine" has to be considered as a palliative, only used for eliminating a security hole in an emergency without changing much of the code. We hope this overview on buffer overflows helps you to program more securely. Even if the exploit technique requires a good understanding of the mechanism, the general principle is rather accessible. On the other hand, the implementation of precautions is not that difficult. Don't forget it's faster to make a program secure at design time than to fix the faults later on. We'll confirm this principle in our next article about format bugs.